The objective of this study was to evaluate the renal RI in children with T1-DM and to compare the values with normal healthy children and analyze whether it would help to predict early DN. The study was designed as a case control cross-sectional observational study; we studied 25 cases with T1-DM (Group-A) and 20 age-matched healthy children who served as the control group (Group-B). There were 15 females and 10 males in Group A having a mean age of 10.8 ± 2.2 years (7-15 years); the duration of diabetes was 5 ± 1.1 years (3.5-7 years) with confidence interval (CI) at 95% (4.5-5.5). Group-B comprised of 20 healthy children, including 12 females and eight males with a mean age of 11.6 ± 2 years (8-15 years). Patients with a known history of renal disease, serum creatinine >1.3 mg/dL or GFR <60 mL/min/1.73 m 2 , or those who had any medical disease other than diabetes, were excluded. The study was performed at the Department of Pediatrics and Radio-diagnosis, the Zagazig University Hospital, in the period from September 2009 to January 2010. In all patients, a thorough review of their medical files and detailed clinical examination, including measurement of blood pressure (BP), was undertaken. Also, all investigations performed on these patients in the past three months were reviewed and the following tests were performed: serum creatinine, glycosylated hemoglobin (HbA1c), urine examination for AER and assessment of GFR. Lastly, we performed renal Doppler at the Radiology Department. The mean value of three consecutive measurements of HbA1c was considered representative of metabolic control. The HbA1c was analyzed by HPLC (variant II, Bio-Rad), with the normal range being 4.5-6.5%. The normal range for GFR in our laboratory is 80-130 mL/min/1.73 m 2 . Patients were considered to have a hyper-filtering kidney when the GFR was higher than 130 mL/min/1.73 m 2 (higher limit of normal). RI = (peak systolic velocity - end diastolic velocity) / peak systolic velocity. All selected cases were subjected to B-mode ultrasonographic examination of both kidneys for assessment of the renal size, shape and echogenicity and to exclude other renal diseases. 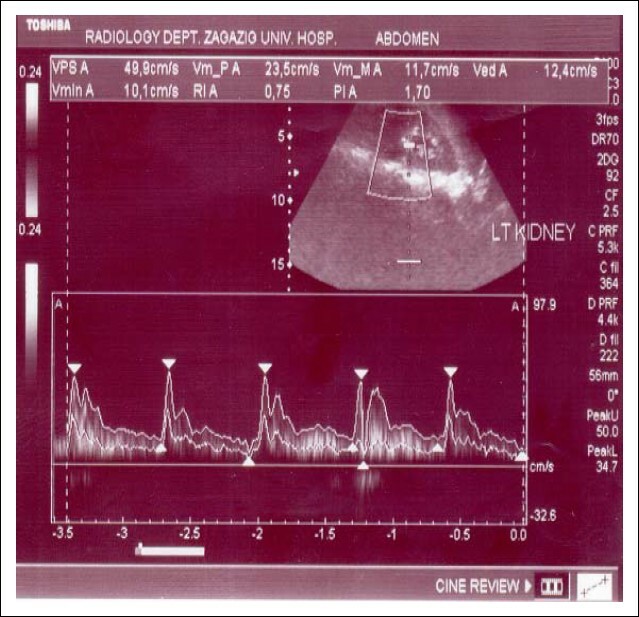 Also, color Doppler ultrasonography examination of the intra-renal arteries was performed using a 3.5 MHZ convex transducer (Toshiba Nemio Medical System). Statistical analysis was performed using a computer-based program (SPSS version 11). The quantitave data are presented as mean ± standard deviation. Unpaired independent t test is the statistical test of significance for the two groups. P-value less than 0.05 indicated statistical significance. Pearson correlation was done to express the correlation between the two parameters. There was a significant increase in HbA1c, GFR and mean renal RI in Group-A patients when compared with Group-B; P < 0.05 [Table 1]. No significant difference was seen in the age, serum creatinine or AER between the two groups; P >0.05. [Figure 1] shows the range of mean RI in Group-A and Group-B patients. 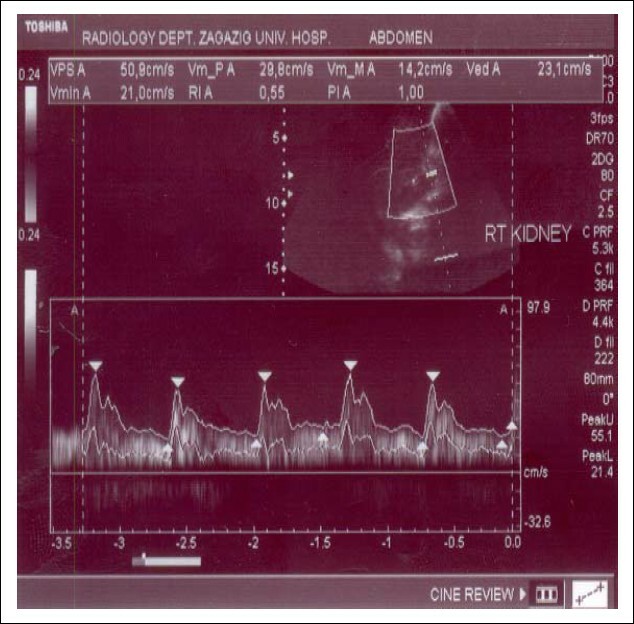 [Figure 2] shows a nine-year-old child from Group-B with RI in the right kidney of 0.55 and [Figure 3] shows an 11-year-old child with T1-DM for seven years, with RI in the left kidney of 0.75. 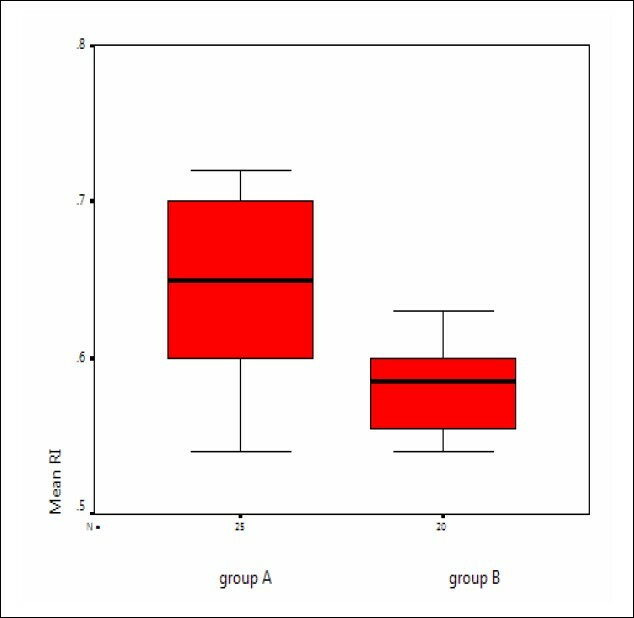 Figure 1: The range of the mean resistive index in patients in Group-A and Group-B. Figure 2: A nine-year-old child from Group-B with right kidney resistive index of 0.55. Figure 3: An 11-year-old child with type-1 diabetes mellitus for 7 years with left kidney resistive index of 0.75. 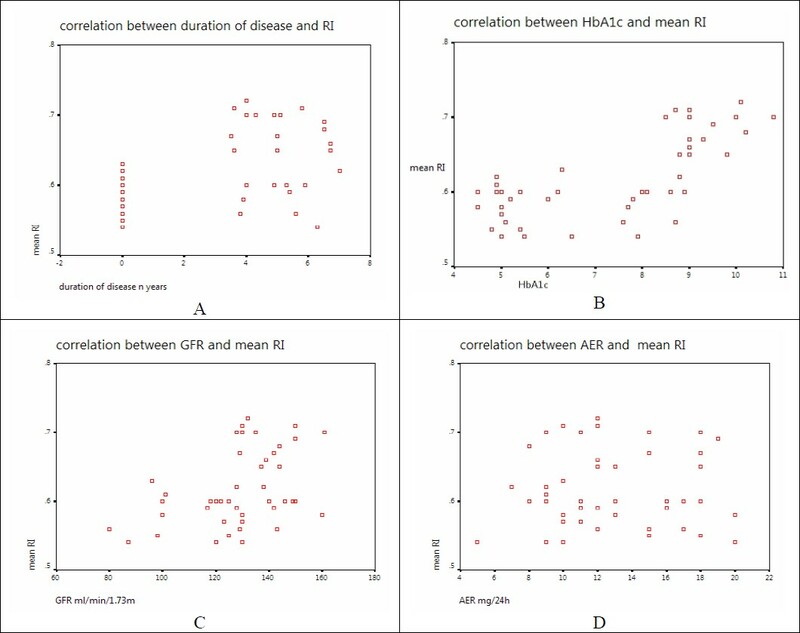 [Table 2] shows a negative correlation between mean renal RI and age, positive correlation between mean RI and duration of disease and positive correlation between HbA1c and GFR, while there was no correlation between mean renal RI and serum creatinine or AER. [Figure 4] shows the correlation between different parameters and mean RI; [Figure 4]a shows a positive correlation between duration of the disease and mean RI, [Figure 4]b shows a positive correlation between HbA1c and mean RI, [Figure 4]c shows a positive correlation between GFR and mean RI and [Figure 4]d shows lack of correlation between AER and mean RI. Figure 4: Correlation between different parameters and mean resistive index (RI); (a) shows positive correlation between duration of disease and mean RI, (b) shows positive correlation between glycosylated hemoglobin and mean RI, (c) shows positive correlation between glomerular filtration rate and mean RI, (d) shows no correlation between albumin excretion rate and mean RI. The patients in Group-A had a higher HbA1c (8.9 ± 0.8%) than those in Group-B (5.2 ± 0.57%); this level is higher than the recommended target HbA1c level of less than 7.5% [National Institute of Clinical Excellence (2004),  and Australasian Pediatric Endocrine Group (2005)]. Surveys of glycemic control have consistently demonstrated similarly poor control in other regions: the mean HbA1c level was 8.8% in Asia and the Western Pacific Region,  8.3% in the Hvidore study (Mortensen and Hougaard, 1997),  8.2% in New South Wales, Australia Craig et al, 2002,  8.7% in Scotland (Scottish Study Group for the Care of the Young Diabetic), 2001,  and 9.0% in France, Rosilio et al, 1998. This could be because not all children with T1-DM in our area monitor blood glucose levels regularly at home, which in turn could be due to monetary reasons. We conclude that renal RI increases in children with T1-DM, which positively correlated with age, duration of disease, HbA1c and GFR, and was independent of AER. Thus, renal RI can be used as an early predictor of DN. We recommend more studies on a larger sample size to confirm our findings. 1. Loredana M, Francesco CH. Diabetic nephropathy. In: Ellis D (editor) text book of Pediatric nephrology, 6 th ed Avner, William E. Ed Harmon and Patrick Niaduet publishers; 2009;50:1199-217. 2. Gross JL, de Azevedo MJ, Silveiro SP, Canani LH, Caramori ML, Zelmanovitz T. Diabetic nephropathy: diagnosis, prevention, and treatment. Diabetes Care 2005;28:164-76. 3. Steinke JM, Mauer M. International Diabetic Nephropathy Study Group: Lessons learned from studies of the natural history of diabetic nephropathy in young type 1 diabetic patients. Pediatr Endocrinol Rev 2008;5:958-63. 4. Joner G, Brinchmann-Hnsen O, Torres CG, Hanssen KF. A natiom wide cross-sectional study of retinopathy and Microalbuminuria in young Norwegian type 1 (insulin-dependent) diabetic patients. Diabetology 1992;35:1049-5. 5. Michele D, Paola F. Diabetic nephropathy: Renal structural studies in type 1 and type 2 diabetic patients. International Congress Series 2003;1253:163-9. 6. Sperandeo M, D'Amico G, Varriale A, Sperandeo G, Annese MA, Correra M. Pulsed-wave color Doppler echography of the intra-renal vessels in patients with insulin-dependent diabetes mellitus and incipient nephropathy. Arch Ital Urol Androl 1996;68:183-7. 7. Zenere BM, Arcaro G, Saggiani F, Rossi L, Muggeo M, Lechi A. Noninvasive detection of functional alterations of the arterial wall in IDDM patients with and without microalbuminuria. Diabetes Care 1995;18:975-82. 8. Jerums G, Premaratne E, Panagiotopoulos S, Clarke S, Power D, MacIsaac R. New and old markers of progression of diabetic nephropathy. Diabetes Res Clin Pract 2008;82 suppl 1:30-37. 9. Masulli M, Mancini M, Liuzzi R, et al. Measurement of the intrarenal arterial resistance index for the identification and prediction of diabetic nephropathy. Nutr Metab Cardiovasc Dis 2009;19:358-64. 10. Piernicola P, Alessandra S, Cristina C, Alessandra P, Cosima S, Francesco CH. Early Changes in Renal Hemodynamics in Children with Diabetes: Doppler Sonographic Findings. J Clin Ultrasound 2008;335-40. 11. Kuzmic AC, Brkljacic B, Ivankovic D, Galesic K. Doppler Sonographic renal resistance index in healthy children. Eur Radol 2000;10:1644-8. 12. Najafian B, Mauer M. Progression of diabetic nephropathy in type 1 diabetic patients. Diabetes Res Clin Pract 2009;83:1-8. 13. Dacher JN. Doppler evaluation of native kidney in children. JEMU 1998;19:126-30. 14. Marzano M, Pompili M, Rapaccini G, et al. Early Renal Involvement in Diabetes Mellitus: Comparison of Renal Doppler Us and Radioisotope Evaluation of Glomerular Hyperfiltration. Radiology 1998;209:813-7. 15. Amin R, Widmer B, Prevost AT, et al. Risk of microalbuminuria and progression to macroalbuminuria in a cohort with childhood onset type 1 diabetes: Prospective observational study. BMJ 2008;336:697-701. 16. Radovan B. Diabetic nephropathy in children and adolescents. Pediatr Nephrol 2008;23:507-25. 17. National Institute of Clinical Excellence. (2004) Type 1 diabetes: Diagnosis and management of type 1 diabetes in children, young people and adults. National Institute of Clinical Excellence, London, UK. available from: http://www.nice.org.UK/CG015NICEguideline (Last accessed on January 2012). 18. Australasian Paediatric Endocrine Group for the Department of Health and Ageing. (2005). Clinical practice guidelines: Type 1 diabetes in children and adolescents. National Health and Medical Research Council, Canberra, Australia, (available from: http://www.nhmrc.gov.au/ publications/_files/cp102.pdf (Last accessed on January 2012). 19. Maria E, Timothy W, Martin S, Yeo J. On behalf of the International Diabetes Federation Western Pacific Region Steering Committee Diabetes care, glycemic control, and complications in children with type 1 diabetes from Asia and the Western Pacific Region. J Diabetes Complications 2007;21:280-7. 20. Mortensen HB, Hougaard P. Comparison of metabolic control in a cross-sectional study of 2,873 children and adolescents with IDDM from 18 countries. The Hvidore Study Group on Childhood Diabetes. Diabetes Care 1997; 20:714-20. 21. Scottish Study Group for the Care of the Young Diabetic. Factors influencing glycaemic control in young people with type 1 diabetes in Scotland: A population-based study (DIABAUD2). Diabetes Care 2001;24:239-44. 22. Rosilio M, Cotton JB, Wieliczko MC, et al. Factors associated with glycaemic control. A cross-sectional nationwide study in 2,579 French children with type 1 diabetes. The French Pediatric Diabetes Group. Diabetes Care 1998;21:1146-53. 23. Soldo D, Brkljacic B, Bozikov V, Drinkovic I, Hauser M. Diabetic nephropathy: Comparison of conventional and duplex Doppler ultrasonographic findings. Acta Radiol 1997;38:296-302. 24. Frauchiger Bhttp://ndt.oxfordjournals.org/cgi/content/full/ 15/6/827 - FN1, Nussbaumer P, Hugentobler M, Staub D. Duplex sonographic registration of age and diabetes-related loss of renal vasodilatory response to nitroglycerine Nephrol Dial Transplant 2000;15:827-32. 25. Okten A, Dinc H, Kul M, Kaya G, Can G. Renal duplex Doppler ultrasonography as a predictor of preclinical diabetic nephropathy in children. Acta Radiol 1999;40:246-9. 26. Casadei A, Floreani M, Fanolla A, Gaspa U, Marchesi M. Renal Doppler color ultrasonography in the study of diabetic nephropathy. Arch Ital Urol Androl 2000;72:205-10. 27. Raes A, Matthys D, Donckerwolcke R, Craen M, Van Aken S, Vande J. Renal functional changes in relation to hemodynamic parameters during exercise test in normoalbuminuric insulin-dependent children. Acta Pædiatr 2007;96:548-51. 28. Marzano MA, Pompili M, Rapaccini GL, et al. Early renal involvement in diabetes mellitus: Comparison of renal Doppler US and radio-isotope evaluation of glomerular hyperfiltration. Radiology 1998;209:813-7. 29. Sari A, Dinc H, Zibandeh A, Telatar M, Gumele HR. Value of resistive index in patients with clinical diabetic nephropathy. Invest Radiol 1999;34:718-21. 30. Platt J, Rubin J, Ellis J. Diabetic nephropathy: Evaluation with renal duplex Doppler US. Radiology 1994;190:343-6. 31. Ishimura E, Nishizawa Y, Kawagishi T, et al. Intrarenal hemodynamic abnormalities in diabetic nephropathy measured by duplex Doppler sonography. Kidney Int 1997;51: 1920-7. 32. Naroei M, Jafari B, Alipour P. Arterial Resistive Index (RI) in Type II Diabetic Nephropathy Stages and Healthy Controls. Iran J Radiol 2009;6:29-32. 33. Afsar B, Elsurer R, Sezer S, Ozdemir FN. Insulin resistance is associated with increased renal resistive index independent of other factors in newly diagnosed type 2 diabetes mellitus and hypertensive patients. Metabolism 2010;59:279-84. 1 Resistive intrarenal index: myth or reality? 2 Resistive intrarenal index: myth or reality?